In the kingdom of Arendelle, sisters Anna and Elsa grow up separated by a tragic case of magic. 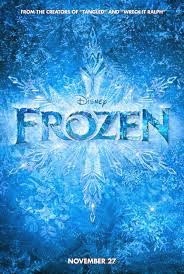 Elsa’s ability to turn her surroundings into ice—a power made more dangerous by its connection to her emotional state—makes her a constant threat to her sister, and to the future of their kingdom. For years, Elsa’s powers are kept secret, even from Anna. The secret makes an unwelcome public appearance when Anna finally confronts Elsa over her lifetime of ostracism. Soon, the entire land is covered in ice. Elsa runs away, and it’s up to Anna to bring her back and rescue Arendelle from a perpetual state of “always winter, never Christmas” (to steal a quote from another fantasy story). The film has a few mild innuendos—two visual and one verbal. All or most of these pass by without notice. (Until I double-checked the content, I had forgotten about one instance and had missed another one entirely.) There are a couple offhand references to bodily functions, but nothing overtly crass or vulgar. One protagonist’s careless immaturity, while not overtly celebrated, is also never clearly portrayed as negative. I’m also tired of paper-thin Disney princesses, not to mention countless other female leads (digital, hand drawn, and live action). Hollywood’s obsession with thinness isn’t doing anyone any favors. In atypical Disney fashion, one character takes a few humorous—and welcome—jabs at the prospect of rushing into romance. Love at first sight isn’t a standard by which to base any mature relationship. This sets the stage for a third-act display of love that focuses on self-sacrifice instead of romance. The animation in Frozen is gorgeous, especially when ice-related magic takes place. There are several musical numbers, all of which help drive the story forward and/or provide comic relief. Some of the dialogue, especially between ice harvester Kristoff and Anna, is deliciously clever. Unfortunately, less attention has been paid to the two female leads. In fact, there are no strong character arcs for either of them. As revealed by the deluxe edition soundtrack, there was originally an additional song entitled “Life’s Too Short” (designed for around the middle of the story and once again as a reprise) that helps provide those necessary character arcs. Alas, the song was jettisoned from the final version of the film, robbing the princess sisters of some much-needed depth. According to producer Peter Vel Decho, they had a “very short time schedule for this film,” which may be a factor in the above problem. The shortened timeline might also have contributed to some unnecessary slight-of-hand with one character’s motivations. I don’t mind being surprised by plot developments, but I do mind being deceptively misled. These deficiencies don’t derail the story; they simply lessen its overall effectiveness. It’s still nice to see a movie where sibling relationships get almost as much weight as romantic relationships. I just wish the filmmakers had spent a little more time developing stronger platonic plot points. It took me a while to…well, warm up to Frozen, but I finally did. For the most part, the musical numbers serve their purposes; I’m just not a huge fan of most of them. Some feel a little too poppy for the context, but maybe it’s just me. The inclusion of Norse mythology elements, while perfectly functional in the film, didn’t engage me much either. For me, the movie’s saving grace is its humor. There is a sporadic sense of the film not taking itself too seriously, almost on the level of The Emperor’s New Groove. Olaf, the anthropomorphic snowman, is the comedic highlight of the film. Practically everything he said or did had me in stitches. I don’t want to exaggerate, but Olaf may be my favorite Disney sidekick, right up next to Pixar’s Dory. The intended pathos of the film’s climax didn’t ring true to me—due in large part, I think, to the lack of character arcs in the two female leads. I found myself completely disengaged at the most poignant moment of the film, and that’s saying something. I mean, I’m the guy who cries at children’s movies like hippies cry over beached whales. No tears from me during Frozen. If Anna and Elsa’s growth as characters had been more clearly portrayed I would’ve found the climax more moving. I stick around for movie credits (as everyone should), and my stick-to-itiveness was rewarded this time with a couple Easter eggs at the end, including a funny “disclaimer.” If you see the movie, stick around to check it out.